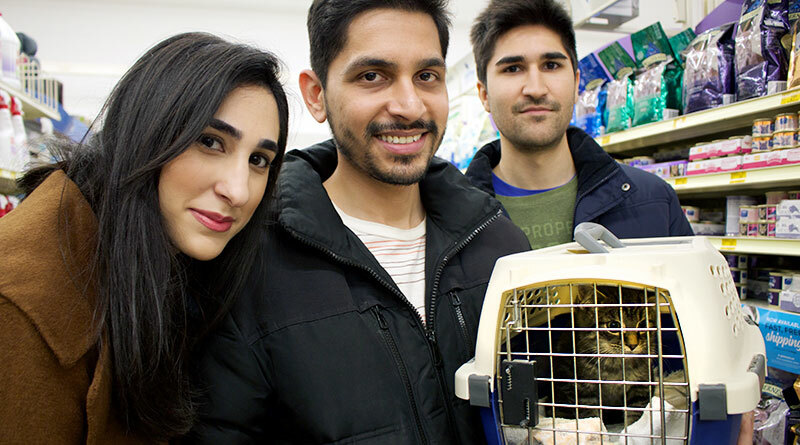 VARSHA RAMDIHOL/TORONTO OBSERVER WELCOME TO THE FAMILY: Ayra, Yousuf and Sheryar Malik adopted their new kitten from PetSmart at Eglinton Avenue East and Laird Drive. The siblings were just some of the people who left with a new pet at the last National Adoption Weekend for the year. Looking into the eyes of a tiny, timid kitten with green eyes is sometimes all it takes to know this is the pet you want to make family. For Ayra Malik, that was the case. After being tagged a week ago on Facebook in an ad for the National Adoption Weekend hosted by PetSmart, she anxiously awaited this day. The 22-year-old’s two brothers each have their own cat but Malik wanted one to call her own. Today, that came true. For people hoping to adopt, the weekend was their chance to add a new family member. PetSmart hosts four national adoption weekends throughout the year, the most popular two being in the summer, Jon Sammons said. On site this weekend were the Toronto Animal Services and the Toronto Cat Rescue. People had the choice of adopting a cat, dog, or bunny at this one stop. Shannon MacDonald, animal care and control officer for the Toronto Animal Services, also hopes each animal finds a family. “The most memorable moment was watching a little dog go home to a new family with three lovely girls,” MacDonald said. While you may be planning your holiday travels, thousands of animals are travelling to find you at any of the 135 locations across Canada, according to PetSmart’s release.